Well what can I say, if you are wanting your day to be perfect then there is no other choosing in regards to a celebrant. Joanne Armstrong is wonderful and charismatic. Her thoughtfulness and incredible interpersonal skills have you feeling super comfortable and relaxed as you enter into possibly one of the most intense times in your life. Her attention to detail, sense of humour, passion and drive to make everything perfect for you helps to make the lead up and the day a delightful experience. Not only do you feel like she is your celebrant but a best friend who has been there for you both through the years knowing just the right things to do and say. Joanne, our sincerest thanks for being you. To anyone reading this undecided, make the call now. You will see what I mean when you have that first catch up. Leonardo and I wanted to say a huge THANK YOU!! You were absolutely sensational! Whilst already coming highly recommended to us by our wonderful photographer, you exceeded even my greatest hopes and expectations! You blew us away with you charisma and love from the very first moment we spoke over the phone. Every moment, every conversation and every task leading up to our special day was carefully crafted and meticulously thought out, but fun and joyous! We couldn’t have asked for a more perfect and magical day! Honestly, our ceremony was the most remarkable, intimate and momentous occasion in our lives! You truly brought it to life. We are so beyond grateful, that you handled everything, and I mean EVERYTHING with style and grace. Every single guest at our wedding could not believe how well executed, professional and personal the whole wedding was run! This is a tribute to YOU! You were incredible! You, in our books are by far the BEST Celebrant and most importantly, the most beautiful human being. Hi, we had Joanne celebrate our wedding at Silversprings. What a delivery, especially in how slack we were with communications. She had the patience of a saint and made my husband and crowd feel at ease with her humor and quick wit. Even though we only had contact on the phone she made you feel like the relationship was an old friend. We had so many comments on the ceremony from guests on how well Joanne did. I first heard about Joanne on a couple of wedding pages, her name popped up a few times when I was asking for celebrant suggestions so I decided to send her a message. As soon as I spoke to Jo on the phone I knew she was the celebrant for us, I don’t think I even asked my husbands opinion haha! Over the year we met up for lunches, she met our kids and she really got to know us because she wanted to, not because it was her job. The morning of the wedding she was exactly what we needed, we were all a bit nervous but she calmly told us what we needed to know and how it was going to happen. The ceremony was perfect, people are still talking about it and how it was just so us. It was the perfect balance of happy, funny, serious, silly and it pretty much made everyone cry! Joanne,Well how to describe you to others….Quirky, free spirited, humorous !!!!! 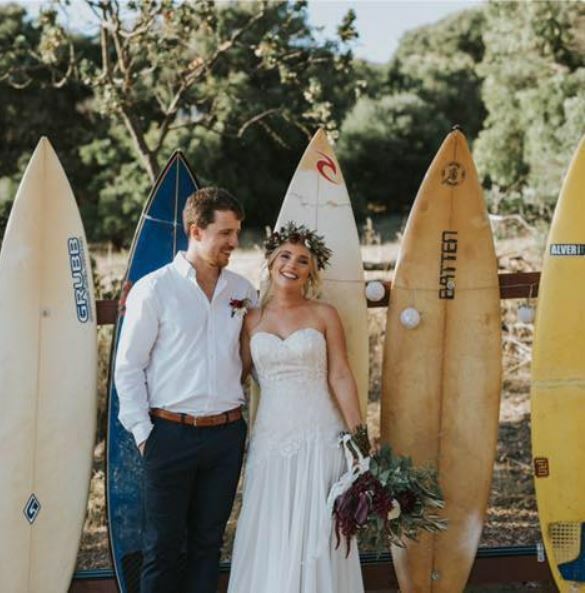 Exactly all the qualities we wanted from our Celebrant on our Special Day.Could not have asked for a more amazing service that what you provided for our ceremony.Made us at ease at what can be a stressful process from engagement to married.Filled our ceremony with love,laughter and smiles. What more could a happy couple want.You shall always have our recommendations to anyone who is looking for an amazing Celebrant for either a traditional wedding or the “out of the box” style you provided for us. Thank you so much for an AMAZING DAY !!!!!!!! !Our guests commented was MOST BEAUTIFUL Ceremony they had ever attended. Choosing a celebrant is probably the hardest and most important decision to make in planning your wedding. Apart from your amazing partner your celebrant is the key link in making this the most memorable day of your life.For us it was a challenge as we are both not religious people and we wanted someone that would make the day special for us.Joanne was an absolute delight.Following a great chat on the phone we had our first meeting at a coffee shop allowing us to relax and get to know what to expect. Joanne was easy to talk to and was keen on learning about both of us. We had plenty more catch ups.Joanne spent a lot of time finding out exactly what would work and how we wanted everything to flow.Her skills and constant flow of information helped not only to plan the day but also in personalising our vows. We couldn’t have asked for a more amazing celebrant to help us start our lives together. From our first meeting Joanne Armstrong put us at ease and made making our dream ceremony come to life easy. She was so supportive and friendly. She helped us to incorporate our family and values into the ceremony to make it truely personal. We felt comfortable and relaxed on the day and the ceremony flowed so naturally. The best and funniest celebrant ever one of a kind!!! Joanne was brilliant. Engaged and very present from the first time we made contact with her, she was warm, honestly caring and interested in Fa and my upcoming nuptials. All the legalities were taken care of, and the ceremony itself was immeasurably enriched by her leading us through the process on the banks of the river. Thank you, Joanne! Joanne have solved our wonder. My partner and I have been searching on the internet for a celebrant to do our wedding. We have crossed few of them but our thought went into a lovely lady with a lovely smile that was Joanna Amstrong. We gave her a call right after we found her contact details online. After we have spoken through the phone, we decided to meet on the next day in one of the Caffee in Margaret River. It was such a nice pleasure of meeting her in person, she was indeed lovely and outgoing person. We felt like we had known her for long time as she brought the sense of a friendship even though that was our first-time meeting. She then told us every detail of what we need to prepare for the ceremony. We met her only once before the wedding and everything was arranging perfectly. We got married on the Valentine’s in Provence Lake Busselton. A lovely wedding ceremony on a Valentine’s Day. She was so competent, committed, and punctual person. What a wonderful wedding, we could not have made it without her effort and commitment. Joanne was awesome, fun, energetic, and so confident person with positive personality. She made our day so special for the rest of our life journey. I would highly have recommended her to any couple who are planning with their wedding ceremony as you can’t go wrong for choosing Joanne as your wedding celebrant. From the bottom of our heart we would like to thank you very much Joanne for being our wonderful celebrant. 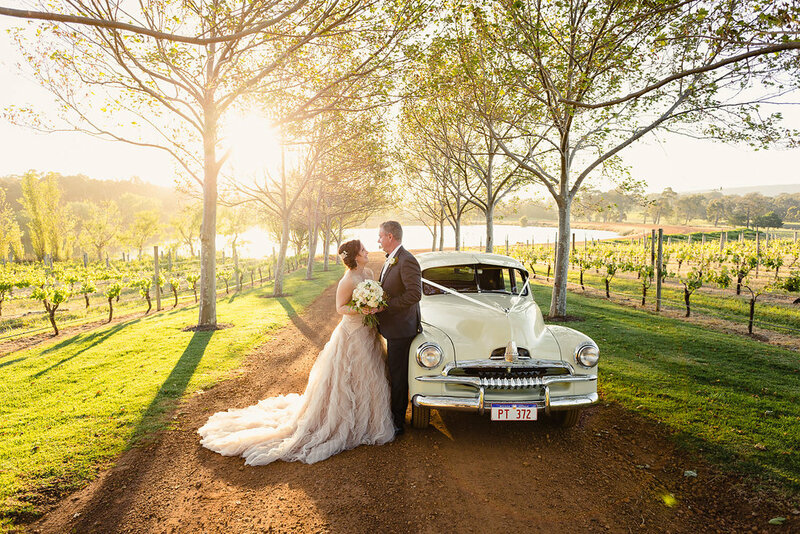 Our most perfect day on March 11th 2017 began about a year earlier when we found our most perfect wedding celebrant Joanne Armstrong, of Wildheart Celebrations. From the moment I spoke to her on the phone I KNEW she was the one for us. Jo is the warmest, most caring, relaxed and hilariously funny girl and she put me at ease straight away. She made planning a wedding in another state so easy. Straight away there was all the info I needed beaming across the country by email. Face to face meetings with us both by Skype and endless phone calls to make sure everything was just right. Nothing is too much trouble for Jo and I’m so glad we took her advice and wrote our own vows because it’s one of the many things our guests comment on. 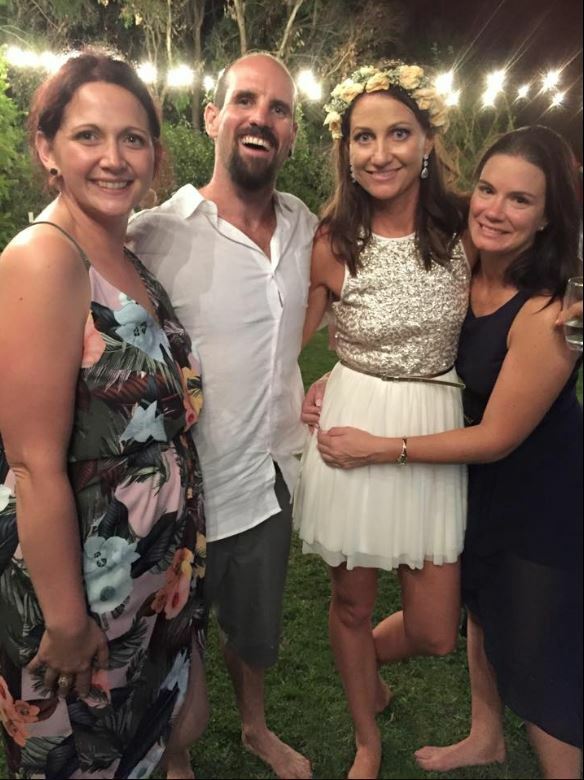 Our beautiful intimate wedding was held in Busselton with a very relaxed hippy vibe at a private house on the beach. The weather was perfect. The ceremony was filled with laughter and fun. Jo even helped us make the official signing fun by suggesting some cheeky poses for the camera. Every one of our guests have told us how wonderful our day was and how lovely our celebrant was. My hubby and I could not be happier with our choice and we have not only had the most amazing celebrant ever officiate our magical day but we have both gained a dear friend in Joanne. Thanks you so much for everything Jo, we will be forever grateful for the gift of YOU! 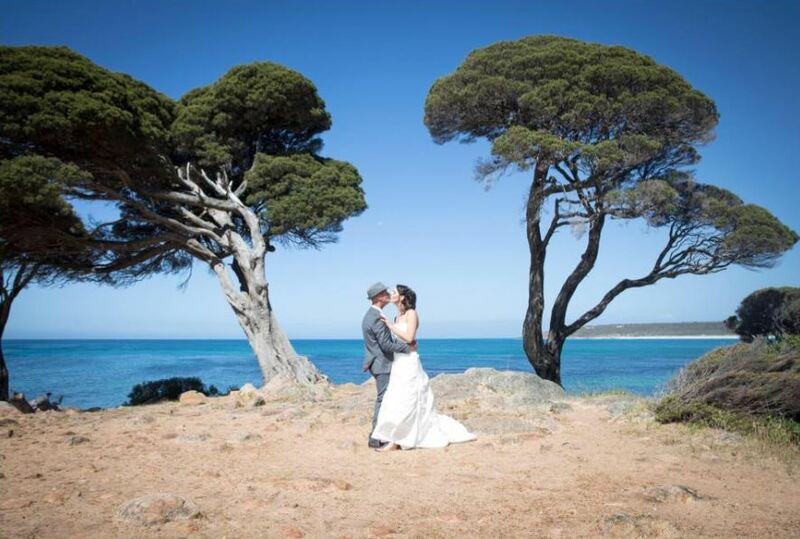 My husband and I recently eloped down at Contos beach near Margaret River. Joanne was amazing throughout the entire experience we both wholly recommend her services. Both my partner and I work FIFO and are not from Margaret River, however she consistently stayed in contact and arranged paperwork where we didn’t have the time. Her energy and enthusiasm for the whole process made the day and experience perfect. She was happy to help us organise a photographer and witnesses as we just wanted the experience to be about us. 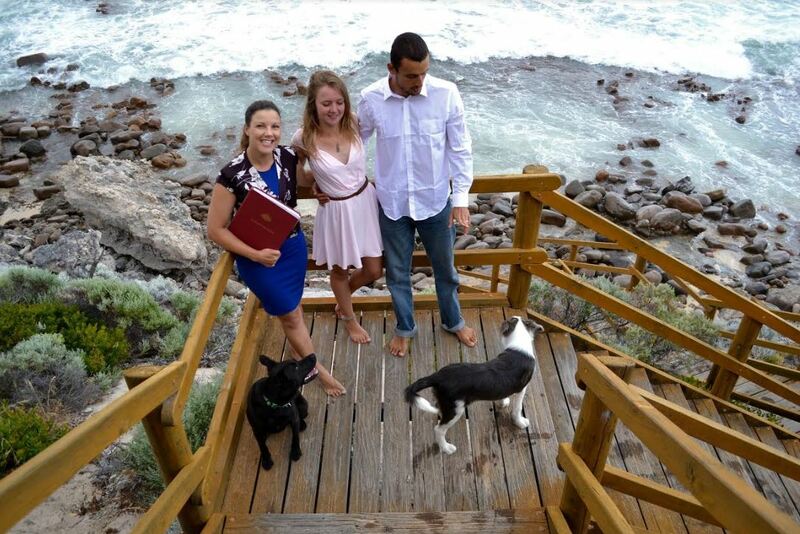 If you are looking for a celebrant down at Margaret River do not go past Joanne, her friendliness and passion about the process cannot be beaten. Joanne made our day and ceremony just perfect this weekend. We were looking for someone a bit different who could make it a bit fun and put us at ease. We loved her fun personality, attention to detail, pushing us to do our paperwork (which we needed), useful tips and hints, her honesty, and making us feel completely at ease during the ceremony. We couldn’t recommend anyone more highly than Joanne. If you’re looking for someone who will make the ceremony just as you imagine and want it to be…this is the lady for you. Joanne Armstrong from Wild Heart Celebrations is an exceptional Margaret River/ South West celebrant. 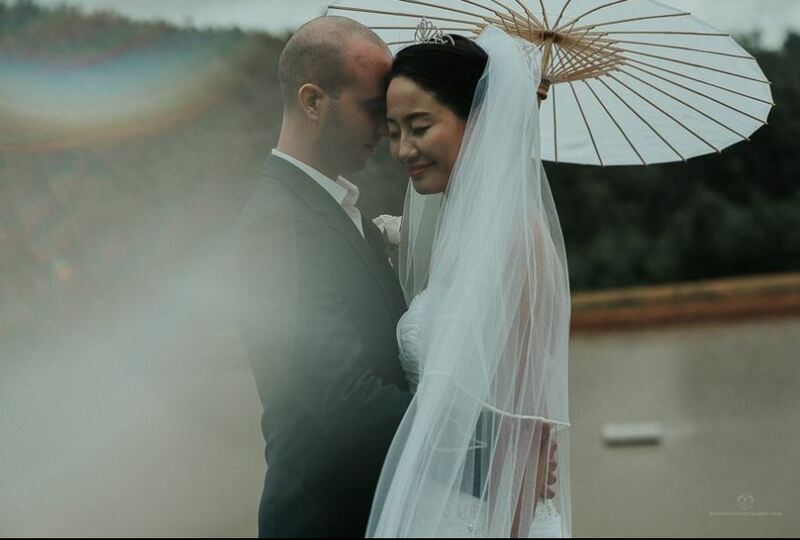 Joanne recently did the ceremony for our wedding in Yallingup and her performance was the perfect combination of thoughtful, funny, sincere and light-hearted. She puts her heart and soul into her ceremonies and our friends and families were highly engaged and entertained throughout the wedding. In the lead up to the wedding Joanne was there whenever we needed her and was very thorough in getting all of our paperwork done ahead of time. On the day she was highly organised and put us completely at ease during one of the biggest moments of our life. She 100% took on board the type of ceremony that we wanted and created something amazing with very little guidance! What can we say? We found Joanne Armstrong was such a pleasure to deal with. What an amazing wedding celebrant, such a belief in love and doing what you feel from the heart. Joanne assisted us every step of the way, emails phone calls and made sure we were on track down to the very minute of our ceremony. Joanne is definitely down to earth, such a caring soul that put her full energy into our special day. She is very professional, committed and willing to work with you regardless of distance. We had never visited the Margaret River, Joanne made us feel at home and a feel we now have made a lifelong friend.I also love the fact Joanne helped us write our own wedding vows, keeping it uniquely us. Joanne made us laugh, and embraced our personal ceremony. We got married in Boranup forest Jan 2017, a spectacular start to 2017 after being together for 15 years.What a perfect day! We could not have done it without Joanne. We only contacted Joanne a month prior to our wedding day, and with such short notice she was able to swing into action, assisted us with all legal aspects, and even our witnesses. Joanne is sweet, well-spoken,humorous,fun and energetic, and she made our special day the most important moment of our lives. We cannot thank her enough. We recommend Joanne for anyone thinking of getting married, large wedding or small we truly believe she will make your day as special as ours. It was such a pleasure getting to meet Jo and to have her as our celebrant. We were needing to find someone down south and were worried about not knowing the celebrant personally but Joanne is just a lovely lady that makes everything clear and simple! We loved her crazy humour, her openness and ability to speak her mind. She was looking out for us the whole way through and we are so grateful for all the tips and info she provided us with! Thank you for adding to the fun of our day! We would highly recommend Jo for your event and shes not bad for a casual hang/laugh too ? ! My husband and I are absolutely thankful to Joanne’s dedication and love on our marriage day. She showed herself helpful and available since the first moment we got in touch. Leading the arrangement with knowledge and passion for the celebration of love. Joanne made sure that everything was running smooth and showed always a spontaneous and responsible attitude including respect with our cultural background (I’m from the Netherlands and my husband from Brazil). Thank you very much Joanne, we had wonderful day! Joanne’s energy is something that you can feel as soon as you have that first phone conversation. Organising a wedding is hard but it’s a whole other experience when you are blindly booking people you have never actually met which is why those initial chats are so important. Jo makes you feel excited about your big day and keeps that motivation flowing right up until that music starts playing. Jo was always available over phone, text and email – although we did have a few technical problems I knew that she would do anything to make sure our day was as chilled and amazing as we had hoped for. Thanks Jo!! xxI’m still waiting on my photos but i’ll add some up as soon as I can!! Joanne was absolutely fantastic in getting us to the point where we wanted to be on our wedding day. Joanne ensured we were kept on track with e-mails and phone calls ensuring all our paperwork was correct and all documents were collected. Joanne had patience when required and persistence when needed. We were also concerned that the wedding celebrant wouldn’t understand the type of ceremony we wanted which was to be very casual and relaxed with no photography (other than the professional photographer). Joanne made us fill in a very detailed questionnaire which it ensured that we got the ceremony we wanted and not what the celebrant thought we wanted. The ceremony was absolutely perfect. All of the guest were also very complimentary of our ceremony and this was only possible due to Joanne, listening and not imposing her own ideas on us but doing exactly as we asked and offering advice which she thought would help us have the day we wanted. Overall Joanne ensured our wedding day got off to the perfect start.Image care of True Love Story. When looking for a celebrant my husband stipulated “young, fun, and not traditional”, and we definitely found that in Joanne. Her dedication to her profession is abundantly clear in the enthusiasm that radiates off her. We knew as soon as we met her that she was the one. In our initial planning stages we wanted a quick ceremony, but after meetings and phone calls and a gentle push from Jo, we created a deeply personal ceremony that truly reflected our relationship and why we were getting married. Writing our own vows, and including a reading really ramped up the emotion in the day and it was really beautiful to see how invested all our family and friends were in our story. Since our wedding I have had so many compliments on how Jo conducted it, and how the guests felt she had known us for years, not just paid to show up for the day. Jo is warm, welcoming, professional, and fresh and I can confidently say that every guest was hooked on every word spoken. She is truly an asset to any couple and we feel we can call her a friend. 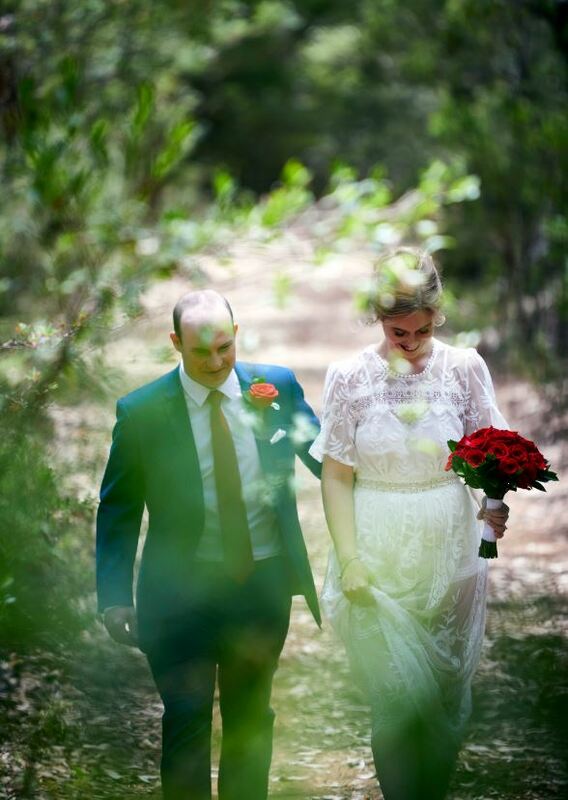 Both my now hubby and I are not from Margaret River or even WA, so finding a celebrant that would suit us perfectly seemed impossible and was based purely on newlyweds online reviews. From the moment we chat with Jo we knew instantly that she fulfilled every promise in all her amazing reviews. Jo is fun, young, fresh, casual yet professional and super enthusiastic. What I’m most grateful for is the push Jo gave us to write our own vows. It was tough but it really made our ceremony just that more personal, heartfelt and special knowing those words were straight from the heart. All our guests also commented on how relaxed and personal Jo made the whole ceremony, throwing in some humour of our life together. She really is a great chick and so very easy to relate to, who just wants your day to be exactly you. Like most have already said, Jo now feels like a good friend who you could spend the night chatting with over a good bottle of wine, cheese and crackers. Thanks for making our day absolute perfection. You really helped shape our wedding day and make it so special! Thank you for everything in the lead up to the wedding and on the wedding day! 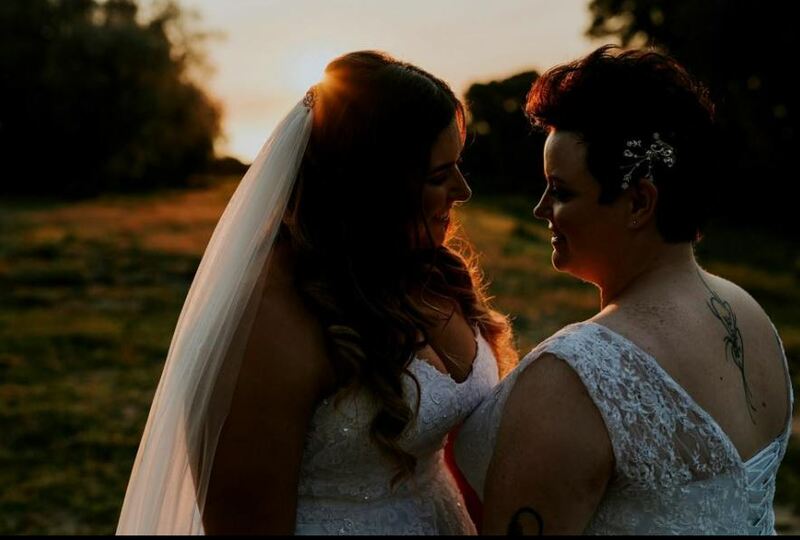 A big reason we chose you as our celebrant was because you’re all for marriage equality and knew that your shining personality would help keep our guests engaged on our special day! 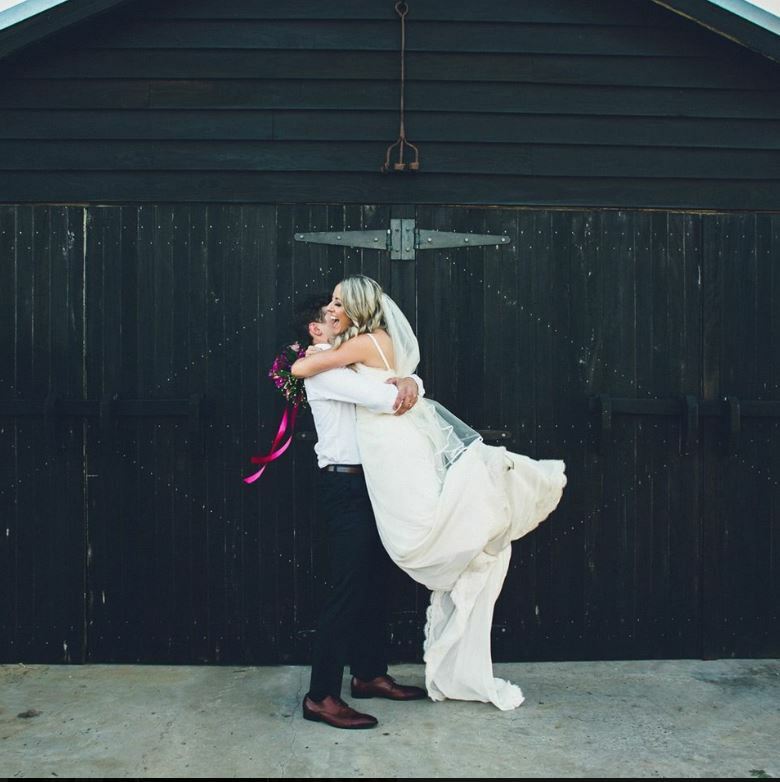 We cannot recommend Jo Armstrong from Wild Heart Celebrations more highly after our wedding experience. From the beginning Jo was warm & funny & put us at ease with a process that we knew nothing about, or really where to start. The most important thing to know about Jo is that she will deliver what you truly want out of your wedding. 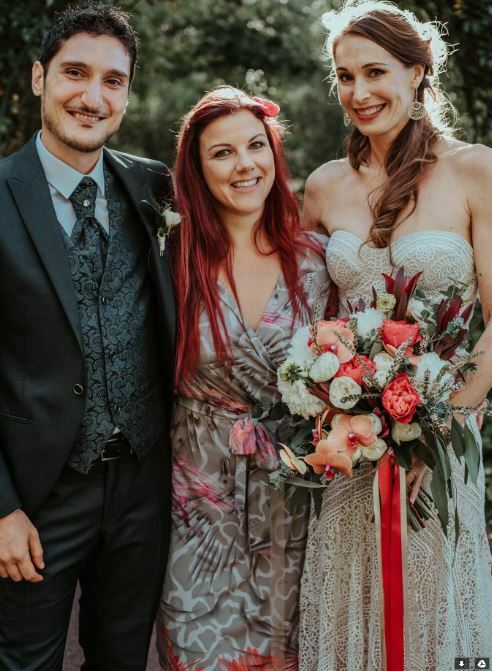 We wanted something different, having our true ceremony overseas in Italy, but needing to get the legal wedding seen to here in Australia. Jo performed the ceremony at our home with two witnesses present, making us feel completely comfortable & natural.She also offered her services in helping us write a ceremony script for our overseas ceremony. We would have been lost without her guidance & suggestions & together we wrote the perfect ceremony for us. Her methods to get us writing our vows & the ceremony script were quite ingenious & took out all daunting aspects we were anticipating. To top it off she has the most gorgeous personality, we felt truly cared for & shared many laughs getting everything right. We would recommend her to anyone thinking about getting married or who would like to know more about the process. Her priority was making sure that we got what we wanted & we certainly did. We were extremely fortunate to have Joanne as our wedding celebrant. Joanne really invested the time in getting to know us prior to the wedding. She did a fantastic job on the day and really personalised the service to us. Friends and family commented on how much they enjoyed the ceremony, just the right mix of professionalism and fun! 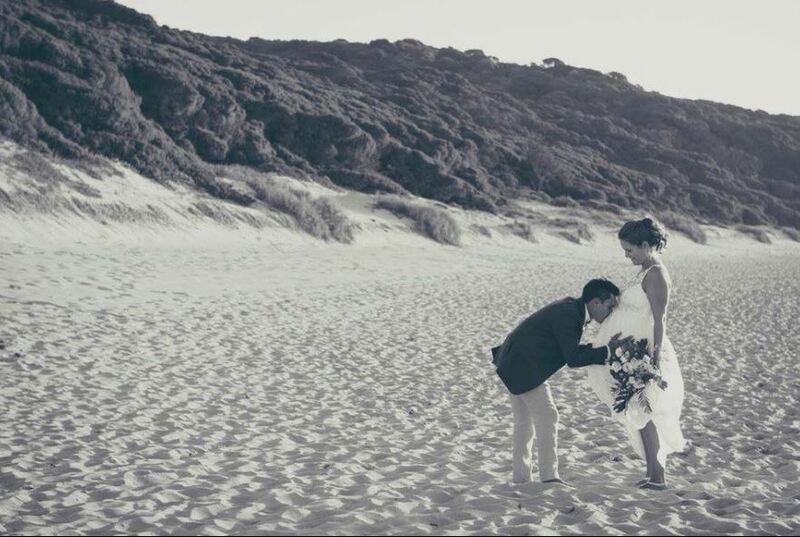 Joanne married my husband and I in April 2016 on Redgate beach in Margaret River. We feel very blessed to have had such a wonderful, supportive celebrant who we quickly considered a friend. She was there with us through the whole process. Joanne brings a perfect balance of professionalism and personality to this very important job. We felt 100% supported and asked as many questions as we needed. Not only did Joanne organise all the formalities so well but also made time to get to know us as a couple and as individuals. We were lucky enough to share dinner and drinks together one very fun night before our wedding. After which my husband and I invited her to our reception as she was so much fun and full of love! On the day she was amazing, our guests even commented! And… To top it all off she even filmed our special day and send it to us!! We couldn’t have asked for a more perfect person to share this special journey and day with us! We are so pleased we chose Joanne Armstrong as our wedding celebrant. When we started looking for a celebrant, we had a firm idea about what we DIDN’T want – stuffy, officious, stiff and overly formal. From my first conversation with Joanne I knew she was none of these things! What we got instead was someone fun, vibrant and with a real passion for her craft. We met over dinner at our house and spent a great night laughing and getting to know each other among the wedding discussion. 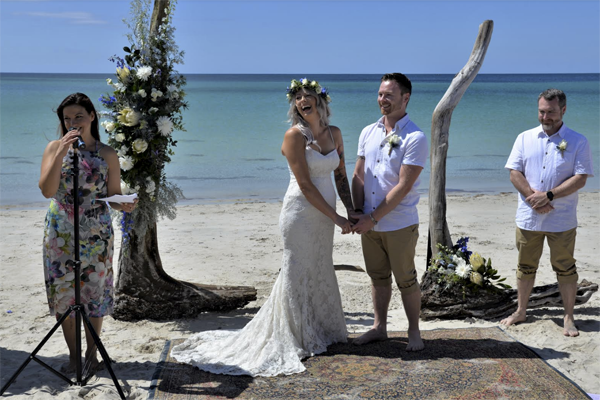 The ceremony itself was amazing, with Joanne’s trademark irreverence and cheekiness punctuating the formalities and provoking giggles from us and our guests. 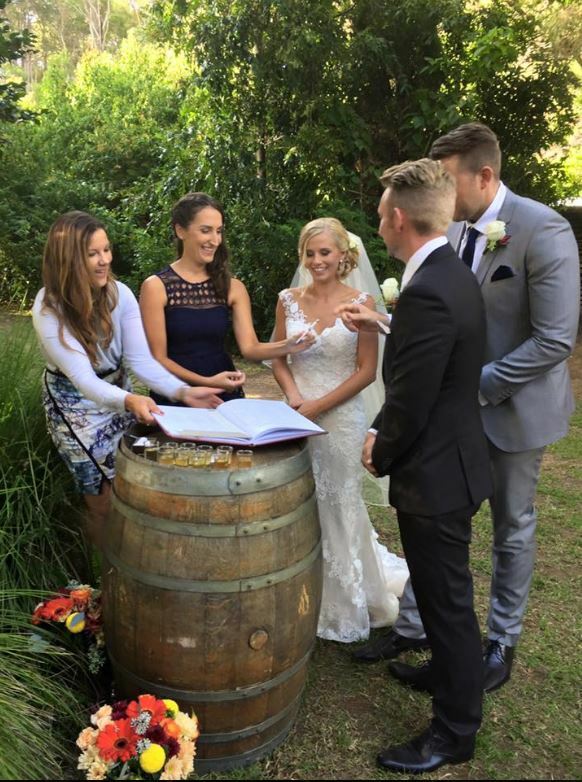 We could not be happier with our choice – we hired a celebrant and ended up with a friend too. 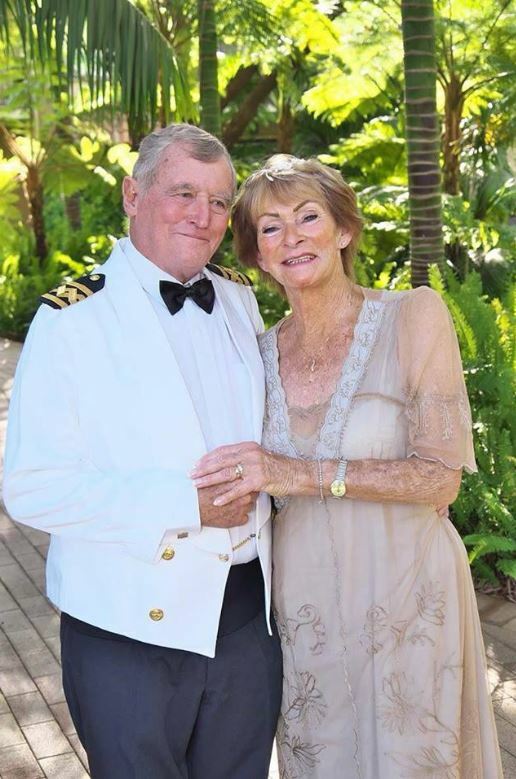 My wife, Margaret (Bab’s) and I were extremely fortunate to engage the services of Margaret River based Wedding Celebrant Joanne Armstrong for our Nautical Wedding. When we met Joanne we knew she was unique and fun. 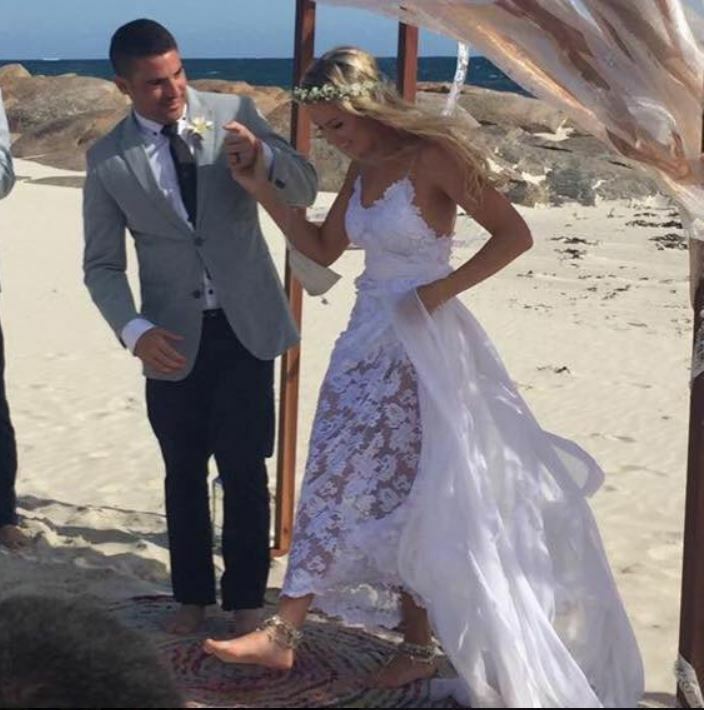 The wedding ceremony took place outside the Chapel at the Wyndham Resort – Dunsborough which further added to our enjoyment. The area decoration was supplied by Bling and arranged by Bab’s and our joint family members. Joanne expertly and fondly embraced the nautical theme and involved our guests in the entire proceeding with her great sense of humour and organisational skills. People asked us why we wanted to get married at a senior’s age and we told them that we just wanted to have a good party. And that is exactly what we had!I was in command for 7 years at sea and later became a marine pilot. Celebrating a theme to suit this occasion was a unique approach and we all decided on a Nautical themed wedding. To synchronise the wedding with my Captains uniform Joanne responded by dressing as a ships Purser and her Uncle Richard Stein (the official photographer – who did a fantastic job) turned up dressed as a Russian sailor complete with cap adorned with a genuine Black Sea Fleet tally band.Joanne handled the guests brilliantly and the three bridesmaids (grand-daughters) performed on cue to the delight of all those assembled. The scene was one of great humour and happiness all around – we could not have had a more enjoyable day. Background guitar music and songs were supplied on cue by the lovely Bella Blackmore. The co-ordination of the entire proceedings by Joanne including a trouble free rehearsal was very competently executed. Joanne, Uncle Richard and Craig joined in with our guests and families at the concluding celebrations and entertainment. The staff and management of the Wyndham Resort (with particular mention the manager Damien, Judy – catering manageress and events co-ordinator – Alisha) completed the reception and accommodation to our entire satisfaction – we thank all who assisted with our fabulous day. Bubbly, energetic, and a fun filled personality, love your work. We can’t recommend Joanne highly enough! We asked Joanne if she would be our celebrant a month before our wedding day and even with such short notice the fact she was so organised and considerate meant that everything on the day went smoothly. She gave us a lot of great guidance, ideas and advice which made the day a lot richer than it otherwise would have been. Cannot recommend Joanne enough, her attention to detail was outstanding and resulted in a truly unique wedding ceremony that suited us perfectly. She went out of her way to get to know us and this really showed. All of our guest thought the ceremony was wonderful aswell, so everyone appreciated her effort! She is lovely and enthusiastic, a beautiful soul! We started planning our wedding a year ago, shortly after we got engaged, and finally the big day has just passed – Saturday Feb 27th 2016. 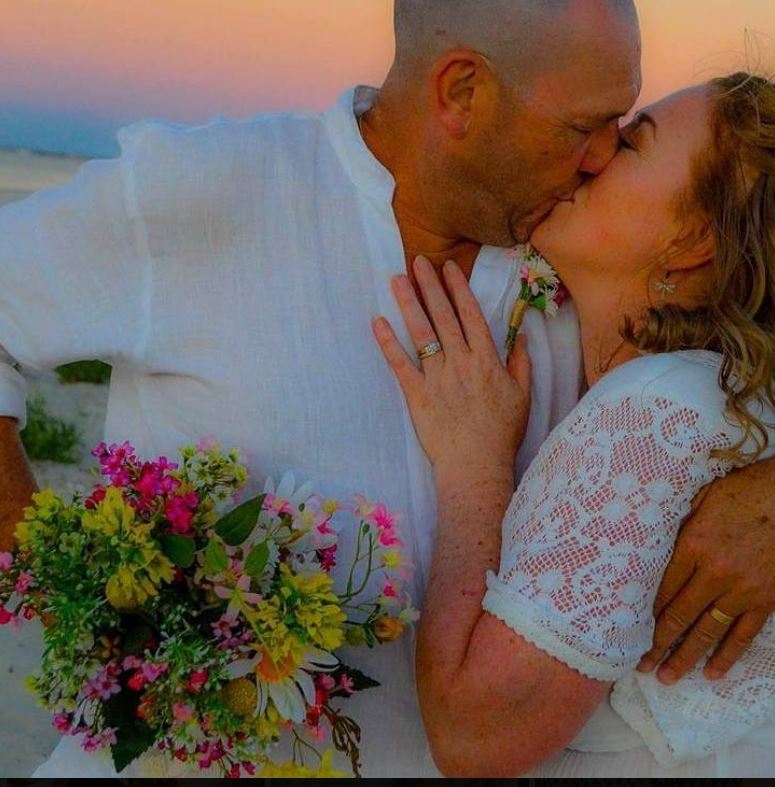 A friend of mine who was helping me plan the wedding gave me a list of celebrants that she had researched and felt would be a good match for Mick & I.
I called the first celebrant, who wasn’t available, and next on the list was Joanne. I found out that she was free on our day and then after a lovely phone conversation I knew that I didn’t need to look at any other possibilities – she was the perfect celebrant for us. From the very start I was taken by her enthusiasm for weddings and passion behind her role in them. I am not a ‘wedding-y’ person but she made me feel at ease from the start. She listened to what I wanted and knew how to make that happen. She has the right mix of giving you the feeling of being a friend but at the same time a professional who will get the job done properly. On the day I was surprised at how nervous I was walking down the aisle and standing in front of everyone, but I could feel Joannes calmness and support throughout the whole ceremony. She kept things light and flowing smoothly, and we got so many comments afterwards from our friends and family on how wonderful they thought she was and how beautiful she made the ceremony. I cannot recommend Joanne highly enough, I have the upmost confidence that she will make your ceremony into a memorable occasion that everyone will enjoy. Thank you Joanne for marrying us!! We couldn’t have asked for a more fun, bubbly and all inclusive celebrant to celebrate our special day with. Your personal touch, friendly, bright personality and beautiful way that you carry yourself made our wedding ceremony so unique and memorable, not only for Barry and I, but for our guests….. I think I speak for both Steven and myself when I say that the care, attention and love you showed towards us in preparing for the ceremony and on the day of our wedding exceeded all our expectations. You understood us as a couple and always kept us on track with time frames to ensure our wedding was stress free!The ceremony was smooth running, intimate and all our guests thought it was very “us”. You also never wavered in your ability to make us feel like the most important people in the world and that is truly a gift. Our wedding was, as they say, the best day of our lives and so much of that is attributed to your hard work.Thank you so very much. 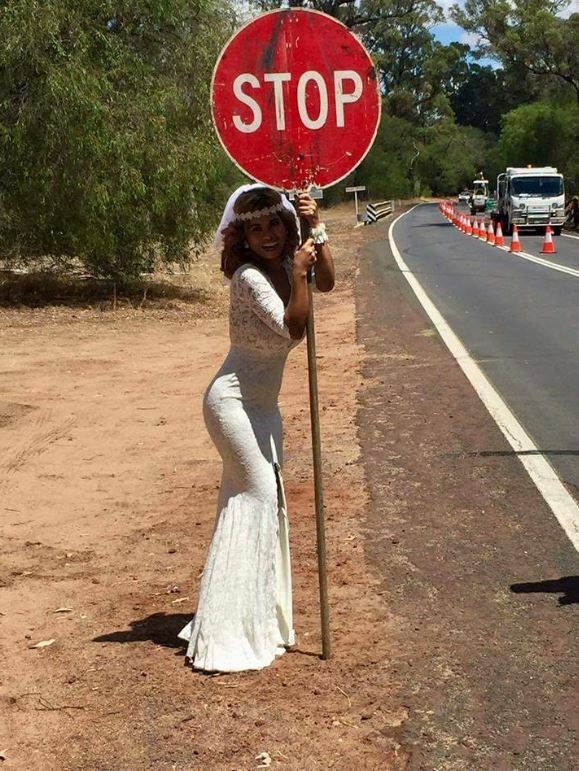 What a gorgeous sassy beautiful lady to have looking after your wedding! Do you want someone to make sure you enjoy your wedding? Weddings ARE beautiful, they are classy but they also don’t need to be stuffy and uptight. Want a spirited fun celebrant to match the mood of you day and get yours guests excited for the reception? Then please, do yourselves a favour and ring her. Joanne has a warm, friendly, and outgoing personality that quickly generates connection and makes you feel comfortable. She has strongly developed people skills and her creative nature easily turns a mundane or routine situation into an enjoyable and special experience. I would highly recommend using Joanne for your special day. Joanne is energetic, warm & friendly. Her ideas, approach and skill will impress you and in no time you’ll realise how Wild Heart Celebrations will make your event memorable. Joanne has a wonderful, warm, outgoing personality that is perfectly suited to sensitive, personal and people oriented events of all sizes. As one of the most passionate and considerate people I’ve met I have no hesitation in recommending Joanne Armstrong for your celebration. Joanne is a true professional with a passion for leaving things better off for having been there. On your special day, make sure you include Joanne as I know she will make it all the better for it. A very bubbly personable and wonderful lady to have worked with. I couldn’t imagine anyone better to help you tie the knot! 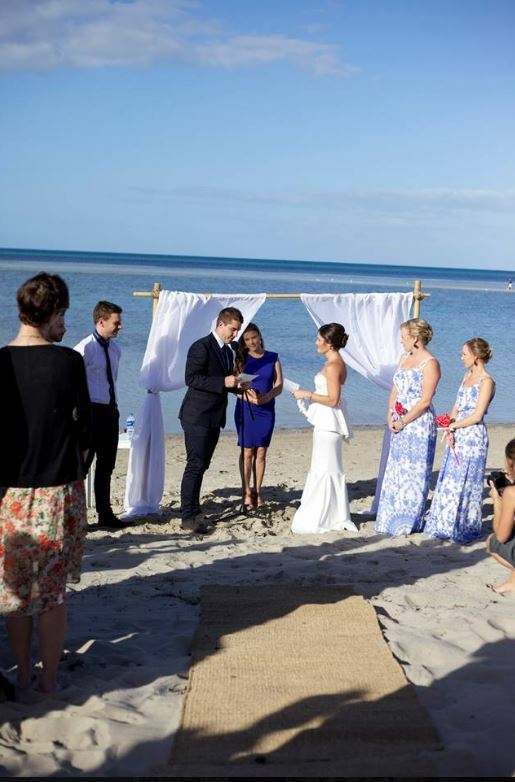 A quiet and relaxed beach ceremony is always a great way to celebrate any wedding. But when you have an exceptional Celebrant to go with this it makes for an even better day. Joanne showed very good composure and control throughout the entire ceremony but at the same time kept in fun, enjoyable and quite unique. Her youthfulness and contemporary style complemented the bride and groom to a tee and had all in attendance encapsulated. In all honesty my experiences of wedding ceremonies is that they can be over scripted and far to structured in nature. Meaning even the slightest of hiccups is noticeable and unwelcoming. Jo did a lovely job as our celebrant for our wedding. Our ceremony was professional as well as that extra touch of personal. We enjoyed our ceremony and felt very relaxed. Jo is a bubbly, outgoing and super friendly person that will go beyond her means to make your ceremony something special and something you will never forget. Thanks heaps Jo. Hi All,Jo married us and she was amazing. The whole process was well thought out and planned by Jo. She encouraged us to be individual and personalize the ceremony. We did just that our rings were cast in on a fishing rod and it was a real hit with our guests. Jo speaks clearly and has just the right blend of humor and professionalism. We definitely chose the best celebrant for our day, I highly recommend her for your ceremony, because you will have one of a kind wedding that people will talk about for a long time to come. Thankyou Jo you were born for this role. If you’re looking for a fun, friendly and modern celebrant, whose communication and planning skills are top notch and who works with you to prepare and deliver the ceremony YOU want – I have no hesitation in recommending Joanne Armstrong. Jo was wonderful throughout the whole process and delivered a lovely and memorable ceremony on our special day. Jo’s calm and fun personality certainly made it easier for me to relax in the lead up to our wedding and on the day itself too. I cannot thank Jo enough for her part in making our day perfect. 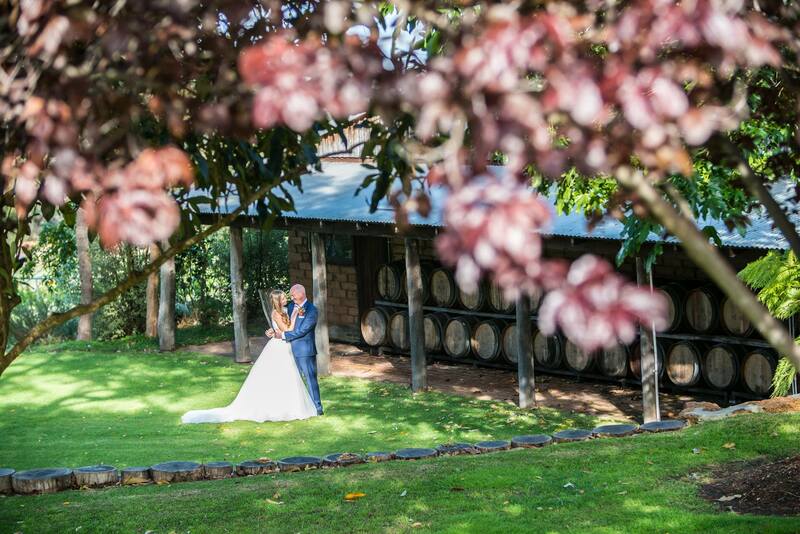 Thank you so much Joanne Armstrong from Wild Heart Celebrations for marrying us at the beautiful Sandalford Winery on the 27th December 2014. From our initial meeting to the day of the wedding, you placed a large amount of effort in getting to know us intimately, by having several meetings with us prior to the big day, providing constructive feedback to ensure our wedding vows were perfect. The attention to detail in ensuring everything ran smoothly, even at the rehearsal, you made sure we felt comfortable and placed us at ease. This set the tone for what had turned out to be a great day enjoyed by all the guest, with many saying it was one of the best weddings they have ever attended. If you want someone to add that personal touch and a little quirkiness to your wedding day, look no further and seek out this awesome celebrant Joanne Armstrong. Open, friendly, engaging – and what I like about Joanne is that she is true to the heart. Highly recommended. WHAT AN AMAAAZING DAY! joanne is a quirky, funny, cheeky, beautiful lady who brings so much light into the room when she walks in. her bright bubbly nature gave us a sense of ease on our day, as everyone, we were both nervous and anxious on our wedding day. jo gave nothing but consistent support and communicated with us through-out the entire process and helped us with whatever we needed (even my freak out meltdown moments when i had no idea what i was doing regarding writing my own vows!! which, ended up perfect because of her help and guidance) . our wedding day wouldn’t have gone so smoothy if it weren’t for jo. she is professional and she is your friend. i highly recommend to anyone who is willing to have fun and wants to have the most rememberable day of their lives!!! Dear Joanne,A BIG thank you for our wonderful day of December 21st, 2014! Obviously, this was our first (and hopefully the only one 🙂 ) marriage, therefore we have not too much to compare it with, however you made us feel confident, free and fun from the very beginning! Since we are not locals to Australia and WA, there were a lot of questions, a lot of unknown.. you made us feel like nothing is impossible – like everything is possible! 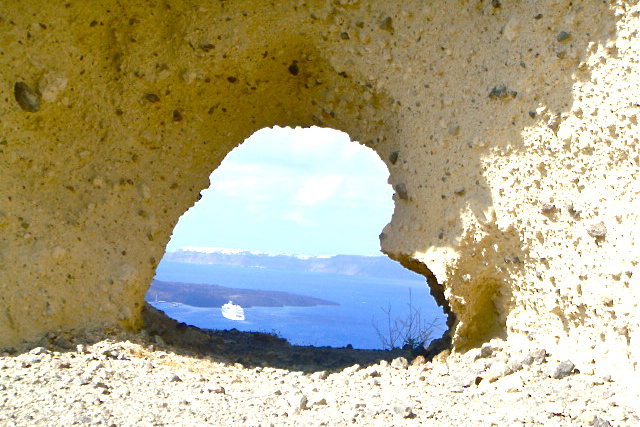 And, really, with you – THE DAY can be whatever one can think of. Your fun character, your honest behaviour and personality made us feel right at home. You had so many different ideas and suggestions, but you always left the choice up to us. And that is super important. Now, when we look back, we truly feel like that day represented who we are. And what else can you ask for? There are million ways of how to get married, and it can be confusing to find the right one for you. You guided us through without any pressure – just with suggestions that very so helpful. It’s so obvious you are in this because you love doing what you do. And that’s why you are great at it! If we would have to do this all over again, we wouldn’t look any further! Thank you and Craig so very much. We have the best of memories of our time in WA and it has a lot to do with you! Warm greetings from Riga, Latvia! Joanne effortlessly made the whole marriage process simple and and easygoing for the both of us and although some meetings were through phone call because of our busy lives, we always felt on track and reassured that things were all in place.Personally, for me I had an issue of picking my father or stepfather that has been in my life since I was 3, to walk me down the aisle. I wanted both of them to have the honour but I was indecisive on what to do because of other’s opinion. Two weeks before the wedding, I am on the phone to Joanne about this issue, almost at breaking point and Joanne was able to change my perspective (to not care what anyone thinks and do what makes me happy!) and helped me come to a decision that I knew was right all along. Her words of wisdom reaffirmed what I always wanted despite other’s opinions. Joanne was not just our celebrant, she is and always will be a dear friend to us.Our ceremony was exactly what we both wanted. Lovey dovey but not too much, quirky, detailed and above all, personal and very much US. Joanne delivered our ceremony gracefully and put a lot of attention to detail. Majority of our guests said there could not have been anyone better to have done the very important task of marrying us.Thank you dearly Joanne, you made our ceremony very memorable and meaningful for us. We wish you all the very best for the future. Joanne was amazing, she really went above and beyond to make our day special. From out first meeting we knew that Joanne was the right choice. She spent the time with us to get the information required to make the ceremony unique to us. Including talking to our extended family to get all the juicy and funny stories required to make the ceremony unique and special.On the day she had the crowd in the palm of her hand. She was funny, passionate and eloquent. She had prepared us so we new exactly what to expect, and the ceremony went perfectly.Maryanne and I cannot recommend Joanne highly enough. If you need a celebrant Joanne will not let you down. Love this professional’s work. Jo was a delight to listen to as she married my daughter a few weeks ago. Nothing boring about Jo. She added her unique flair and joyful nature to a very special day. Can highly recommend her. Thank you Joanne Armstrong for the perfect wedding. I knew from the beginning that I wanted something different and with your help our wedding was everything I ever dreamed possible. It was intimate, personal, fun and engaging, a seamless blend between the traditional and modern. 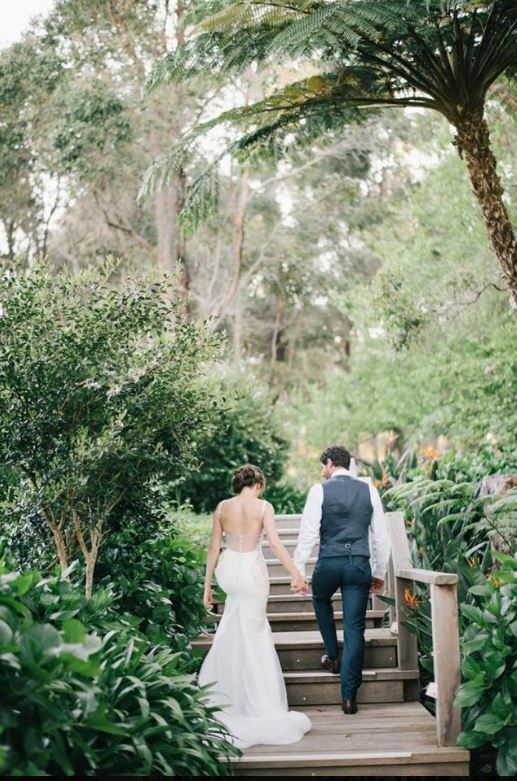 I have had so many of my guests comment on how unique and beautiful the day was. Thank you for helping to create a ceremony which truly reflected our personal love story. Joanne is exactly as what she claimed to be, the BEST Marriage Civil Celebrant! From our very first meeting Joanne Armstrong of Wild Heart Celebrations put us at ease. She was bubbly and charming and totally professional. We were married in an intimate, relaxed, garden wedding and all our guests commented on how lovely the ceremony was and how delightful Jo is. Jo understood our passion for marriage and exactly what we were wanting from our wedding. She had helpful and unique suggestions and took everything we threw at her in stride. Highly recommend. Thanks Jo. What a fun and fantastic day!! Joanne is bright, bubbly, fun and gave us a great sense of calm on our wedding day. We loved our ceremony it was perfect, Jo didn’t miss a beat. She kept our children engaged throughout the ceremony and had really taken in what was important to us. Jo had great ideas and advice when I wasn’t sure about things. She is a great communicator and nothing was too much trouble. Including flying overseas at short notice! Thanks for the lovely memories, Karen & Marcus. It was from reading reviews very similar to this one that made me realise that Joanne was the Celebrant for us. And after our initial telephone conversation, we were not disappointed.Joanne brings something wonderful to the ceremonies she creates – they are completely unique and personalized and tinged with her quirkiness and wicked sense of humour. She encourages you and your partner to dig deep and bring together moments to share – not just with each other but with all of those that have travelled far and wide to share in your special day. Her bubbly personality and approachable manner also makes catch ups and conversations a breeze.But all of this side, Joanne is a consummate professional. Her chosen role as a Celebrant is obviously something that she is passionate about and that is apparent in everything she does. She wants everything to reflect your individual personalities and who you are as a couple and that’s exactly what she did for us! Our ceremony was engaging, romantic and very funny – full of little jokes that only my partner and I would get – it was perfect. 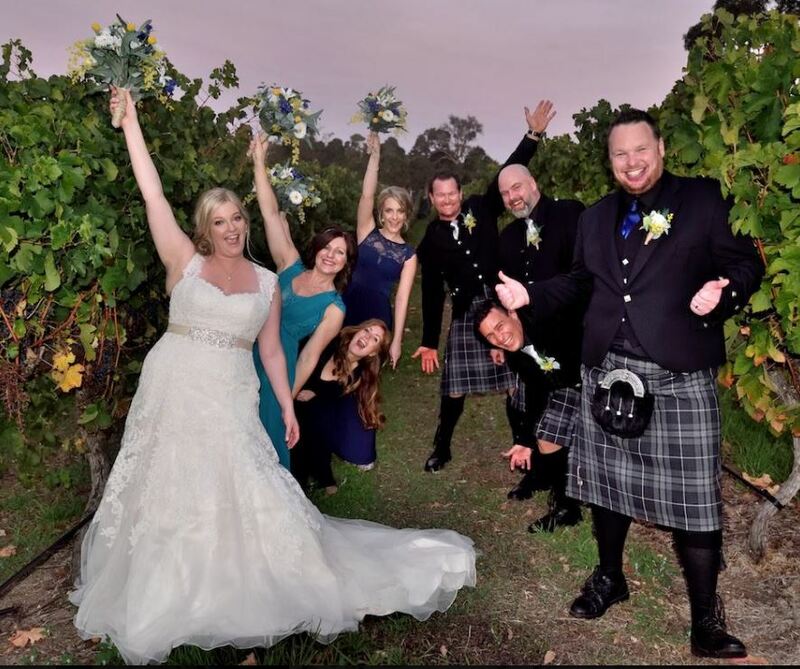 Our guests thought so too, so many remarked afterwards that they had never been to a more entertaining and captivating ceremony!So thank you Jo for such a wonderful day – we cannot recommend you enough!Traci and Kris. Joanne is awesome, very professional, super organized and a great communicator. 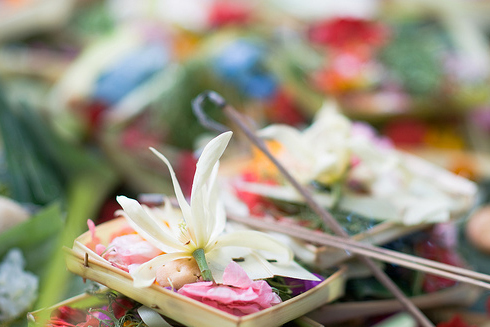 She provided us with a ceremony service that was well balanced; personal, meaningful and humorous. We couldn’t have hoped for a better outcome. A little bit late but not forgotten we want to say thank you for the little ceremony on last October. It was exactly as we imagined it to be – from the easy and uncomplicated come about up to the nice ceremony. We often remember back to the great moment. We will be back in Australia! 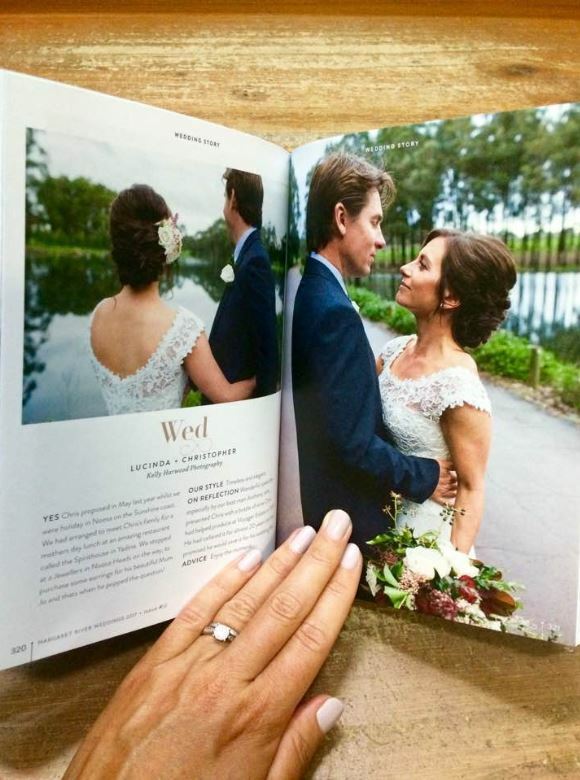 Joanne is one of the most genuine, passionate and unique wedding celebrants. I wish I could have used her service when I got married, which is way too many years ago LOL. Highly highly recommended! Joanne was a helpful, considerate and caring celebrant with a heart of gold. She will do everything possible to make your day unique; that is what she focuses on. She really spends time to get to know you by phone, text and even over lunch. We enjoyed the experience leading up to the wedding and how different she made our ceremony. Joanne also has a lovely speaking voice. if you are looking for a down to earth, modern and romantic celebrant, Joanne is your lady. She truly takes the time to get to know you, and is there to answer all of your questions, and I must say I had a LOT of questions….Joanne is very patient, and after a couple of emails back and forth I felt like we had known each other for ages! 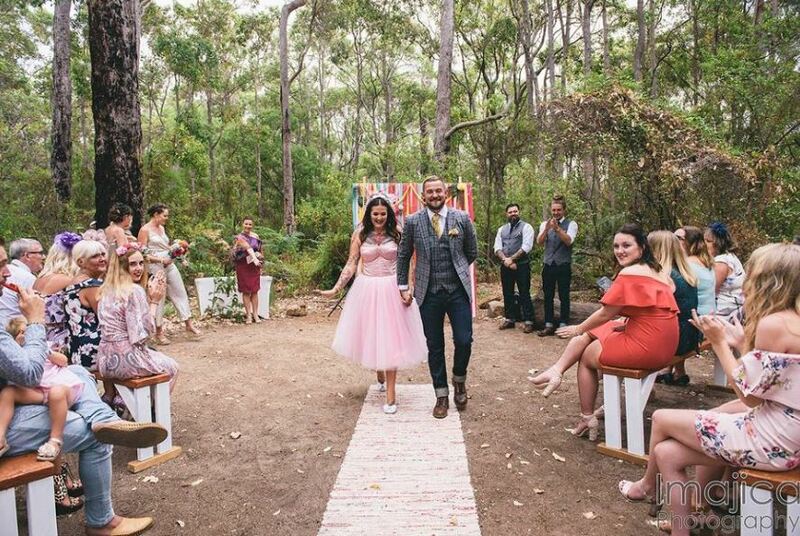 Hubs and I eloped in Margaret River and Joanne made sure the ceremony was kept casual, yet romantic and funny (which is exactly what we wanted! ), i honestly couldn’t of chosen a better celebrant. 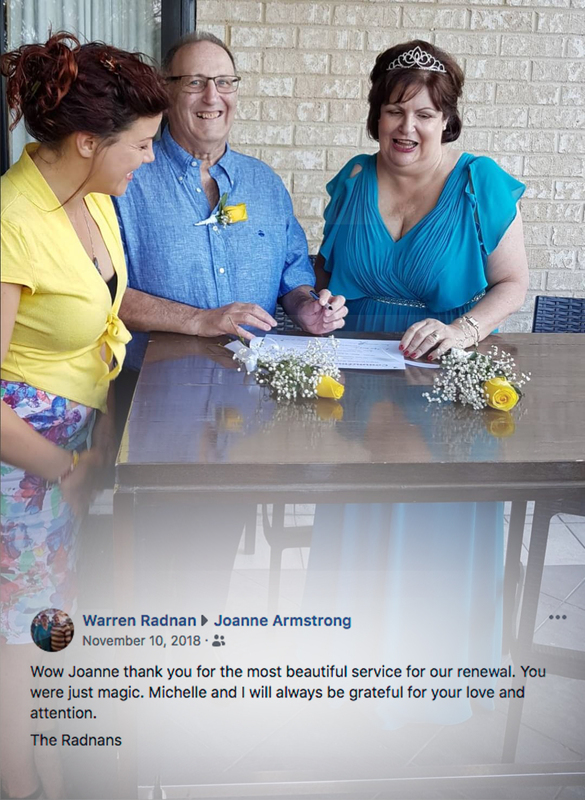 My wife, Margaret (Bab’s) and I were extremely fortunate to engage the services of Margaret River based Wedding Celebrant Joanne Armstrong for our Nautical Wedding. When we met Joanne we knew she was unique and fun. 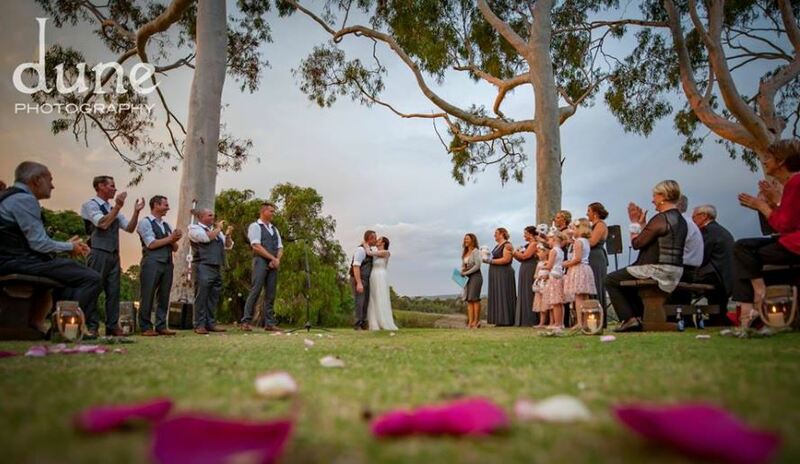 The wedding ceremony took place outside the Chapel at the Wyndham Resort – Dunsborough which further added to our enjoyment. The area decoration was supplied by Bling and arranged by Bab’s and our joint family members. People asked us why we wanted to get married at a senior’s age and we told them that we just wanted to have a good party. And that is exactly what we had! I was in command for 7 years at sea and later became a marine pilot. Celebrating a theme to suit this occassion was a unique approach and we all decided on a Nautical themed wedding. To synchronise the wedding with my Captains uniform Joanne responded by dressing as a ships Purser and her Uncle Richard Stein (the official photographer – who did a fantastic job) turned up dressed as a Russian sailor complete with cap adorned with a genuine Black Sea Fleet tally band. Joanne handled the guests brilliantly and the three bridesmaids (grand-daughters) performed on cue to the delight of all those assembled. The scene was one of great humour and happiness all around – we could not have had a more enjoyable day. Background guitar music and songs were supplied on cue by the lovely Bella Blackmore. Joanne Armstrong was the perfect choice for our wedding celebrant! She was warm and funny, and understood from the outset what we were looking for. Joanne worked hard to get everything from our disorganised selves, but on the day may everything flow seamlessly – I’m so happy we chose Joanne for our special day. Joanne was a perfect pick as the wedding celebrant for our big day. She put so much work into the build up to the event, sending us through samples and step by step advice to help us design the perfect ceremony and even write our own vows, something that made us both rather nervous, but we were so pleased that we took her advice and made the effort. We decided to go ahead with Joanne even though she lived in Margaret River, we were in Perth and the wedding was in the Ferguson Valley, so logistics were a bit challenging. To overcome the challenges of the distance between us, we organised skype calls so that we could go through all the details and get to know the person we were working with. Joanne made a huge effort to get to know us, and at no point did we feel that we were being squashed into a “cookie cutter” standard ceremony plan, like we did with some of the other celebrants we spoke to. The day itself could not have gone any better and it was just how we had imagined it. 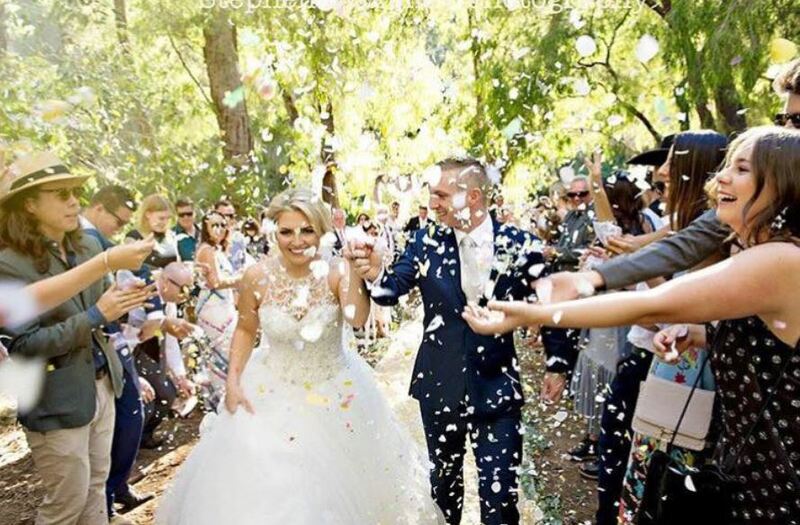 The ceremony was relaxed and personal, and completely individual – Joanne even mastered an Afrikaans accent to appeal to all the Africans at the event. We have had so many people compliment us on the service, and everyone was astounded that Joanne didn’t actually know us personally. She remembered all the details we had discussed in the upcoming months, and completed in our (rather large) questionnaire, and the only complaint received was that she used material that had been included in the speeches for later that night! Jo met us in a relaxed atmosphere and took her time getting to know me and my partner. It was nice having such a relaxed yet organised wedding professional involved in our special day. On the day she was nicely dressed and kept out casual ceremony up beat a flowing. All aspects that we want to incorporate into our ceremony were met with encouragement and excitement. It was an amazing day and the ceremony went off without a hitch a great job and we were very happy with our selection of celebrant. I wanted to take a moment to express my gratitude to Joanne for making this once in a lifetime day so special. If you are looking for a celebrant I cannot recommend Joanne enough. I was fortunate to have friends in the Dunsborough region who have a beautiful & very successful wedding business, of which they generously provided to us for our special day. There are however so many other decisions to make & I really didn’t know where to start with picking a celebrant. I had a list of top suggestions & spoke to each one. Everyone was very nice but I just really clicked with Joanne. To begin with, she was incredibly helpful. She provided us with a great deal of information & samples to read & just really went that extra mile. She had an energy & spirit to her that was so vibrant, enthusiastic & positive. 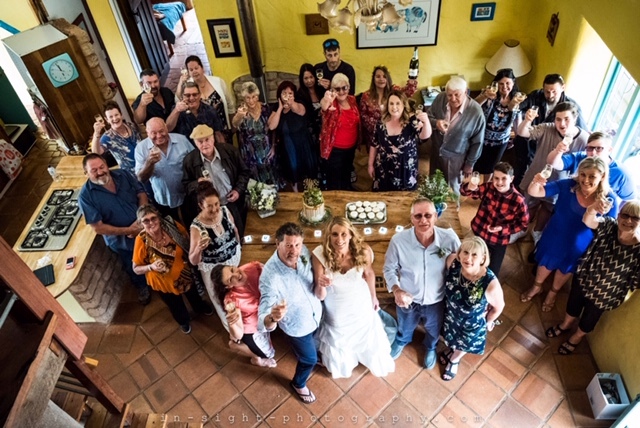 As we lived in Perth & Joanne’s business was based in the Margaret River Region it made it complicated to connect prior to our wedding in 6 weeks time. I was initially concerned about only meeting via Skype but I can say with assurance that going with my gut & choosing her was absolutely the right choice. Joanne spent so much time with us via Skype, phone & email, always guiding us through the process. I felt in such safe hands with her. She helped to alleviate any additional unnecessary wedding preparation stress & I knew that at least this part would run smoothly.As for our wedding itself, Joanne was wonderful. I have to say that on the big day she really told our ‘Love Story’ & did it justice. She walked around during the ceremony & told a story that was very personal & made us both laugh & cry. Most of all she just made us and me in particular feel very relaxed. She created a natural, comfortable & fun environment.Overall Joanne seems passionate about what she does. She takes a true interest in your story & wants to help make the day as special as you always envisioned it to be. She has great attention to detail, incredibly organized & guides you through the entire process. She then makes you feel relaxed & comfortable on the day, allowing the ceremony to not feel stuffy but to feel Genuinely Real. She felt like a part of our family. When there are so many choices to make in planning a wedding I am so grateful that one of the choices I made was picking Joanne. Thank you, you made our day truly beautiful! Awesome personality with a fun loving attitude. Very positive person. Joanne brought such positive vibes to our special day!! Couldn’t have asked for a better celebrant!! She went totally out of her way to ensure a perfect day!! Thanks Joanne!! Absolutely made our day to the most special celebration! Even went the extra mile to do the celebration in german for us! Loved her beautiful spirit and warm and sincere joyful energy!!! Would definetly book her again next time, not a single person there that didn’t shed a tear of happiness by the celebration and her words. Thanks so much for this special memory!! Vibrant & passionate about her weddings! Anyone needing an excellent celebrant contact Joanne for your special wedding event. Look no further. Joanne was superb!We received so many compliments from our guests on how wonderful Joanne was as a celebrant. She ran the ceremony with elegance and humour. She was able to accommodate our requests and perfectly understood the ‘tone’ we were aiming for. She was organised (which I love) and spent time trying to understand exactly what we wanted out of the ceremony. She managed to reflect our laid-back personalities in her style and did not pressure us to say or do anything that we didn’t want to (like readings). The ceremony could not have gone any better. Thank you Joanne! 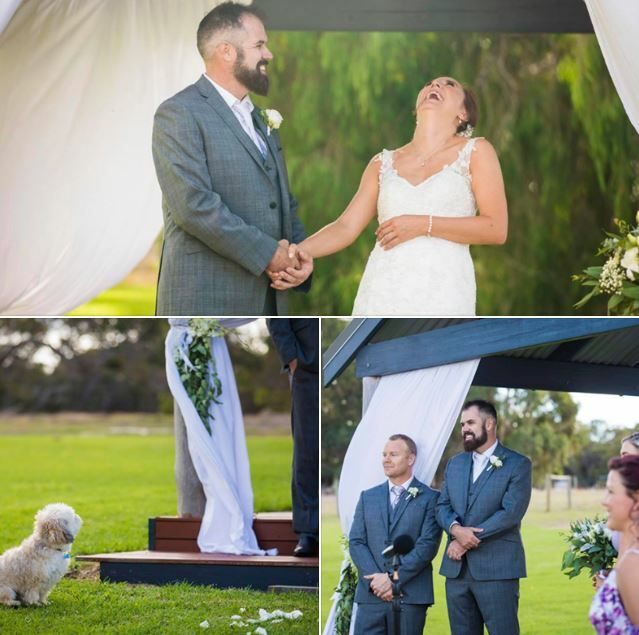 “We were married at the beautiful Old Broadwater Farm in Busselton on 17th October this year – the day was so perfect and having Joanne’s calm and beautiful spirit made our ceremony very memorable. A lot of our guests commented on how personal the ceremony was and how Jo’s light humour was very fitting to us as a couple. Jo was very thorough and helpful throughout the whole process – she always made sure we were on track and didn’t feel overwhelmed. Throughout the ceremony Jo always made sure we had a tissue or a moment to breath when needed and gave us the time to allow the little moments to sink in. Joanne was the perfect celebrant. She was vibrant, full of character, and made us both feel very comfortable to speak openly and honestly. She is an advocate for love, and suits the ceremony to match the couple. She was very diligent with the paperwork making the day stress free! Joanne was very friendly, bubbly, approachable, and funny. I knew on my first phone conversation with her that I wanted her to be my celebrant. In the lead up, Jo was available and happy to help with any questions or to bounce back ideas and on the day, she made our ceremony run very smoothly and was happy to be involved in our non traditional & fun ceremony. She even blended in like a guest on the day which was lovely. I would recommend Jo to anyone who is looking for someone a little different, and more fun than formal. Jo impressed us from the moment we met her with her cheeky, down to earth nature. She got to know who we are, why we love each other and what is important to us. We had a great mix of romance and laughter throughout our ceremony that she delivered brilliantly! Joanne Armstrong was a perfect pick as the wedding celebrant for our big day. She put so much work into the build up to the event, sending us through samples and step by step advice to help us design the perfect ceremony and even write our own vows, something that made us both rather nervous, but we were so pleased that we took her advice and made the effort. We decided to go ahead with Joanne even though she lived in Margaret River, we were in Perth and the wedding was in the Ferguson Valley, so logistics were a bit challenging. To overcome the challenges of the distance between us, we organised skype calls so that we could go through all the details and get to know the person we were working with. Joanne made a huge effort to get to know us, and at no point did we feel that we were being squashed into a “cookie cutter” standard ceremony plan, like we did with some of the other celebrants we spoke to. The day itself could not have gone any better and it was just how we imagined it. 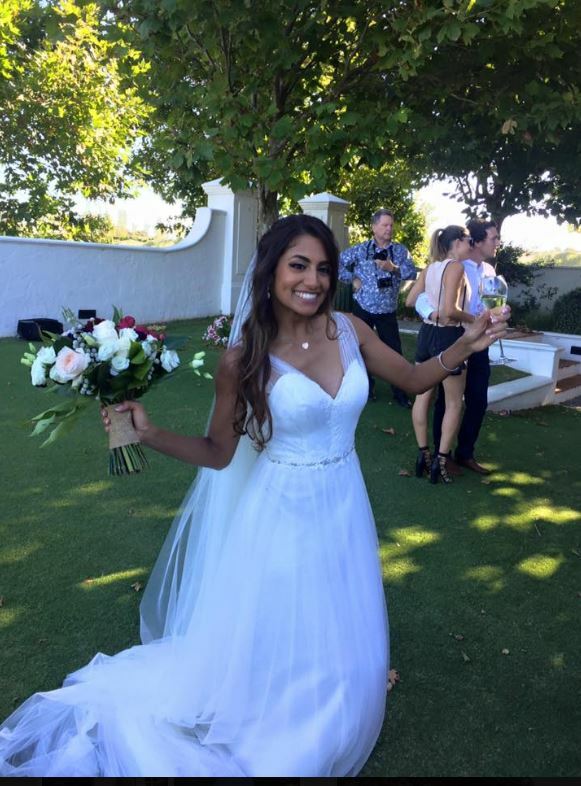 The ceremony was relaxed and personal, and completely individual – Joanne even mastered an Afrikaans accent to appeal to all the Africans at the event. We have had so many people compliment us on the service, and everyone was astounded that Joanne didn’t actually know us personally. She remembered all the details we had discussed in the upcoming months, and completed in our (rather large) questionnaire, and the only complaint received was that she used material that had been included in the speeches for later that night! Joanne was just incredible! We booked Jo in fairly early, earlier than most couples, and got to meet with her a few times before our big day. I feel like I made a true friend. She made us feel right at ease. She is easy going, bubbly and goes the extra mile to make sure the ceremony really reflects you as a couple. She also made it a really fun process and was happy to help with even the smallest queries. If you want a ceremony that is really unique, fun and lighthearted I would recommend Joanne in a heartbeat! We could not have had a more perfect celebrant. She was the perfect blend of organized, fun and supporting. She went out of her way to cater a ceremony that was just for us and in the process got to know almost everything about us. Amazing soul! Joanne is highly recommended. She really took the time to make to get to know each of us and the ceremony we desired. She really put in considerable effort to help us to customize our vows and the ceremony to make it unique and special. All our guests really enjoyed the uniqueness of the ceremony!! Joanne Armstrong was incredible from the beginning! She created the perfect ceremony to suit our personalities and she put her heart and soul into the preparation. Thank you Jo for helping us through the stressful and emotional process of planning a wedding, we couldn’t have done it without you! Joanne was just fabulous. She wanted to make a very personalised service to suit myself and my husband and that is exactly what we had. Beautiful day thank you Joanne! After meeting Joanne for the first time, both Adam and I felt she was the right celebrant for us due to her warm and caring nature. We felt like we were talking to someone we had know for years not a stranger. We also loved her quirkiness as we can relate a lot to it 🙂 Joanne effortlessly made the whole marriage process simple and and easygoing for the both of us and although some meetings were through phone call because of our busy lives, we always felt on track and reassured that things were all in place. Personally, for me I had an issue of picking my father or stepfather that has been in my life since I was 3, to walk me down the aisle. I wanted both of them to have the honour but I was indecisive on what to do because of other’s opinion. Two weeks before the wedding, I am on the phone to Joanne about this issue, almost at breaking point and Joanne was able to change my perspective (to not care what anyone thinks and do what makes me happy!) and helped me come to a decision that I knew was right all along. Her words of wisdom reaffirmed what I always wanted despite other’s opinions. Joanne was not just our celebrant, she is and always will be a dear friend to us. Our ceremony was exactly what we both wanted. Lovey dovey but not too much, quirky, detailed and above all, personal and very much US. Joanne delivered our ceremony gracefully and put a lot of attention to detail. Majority of our guests said there could not have been anyone better to have done the very important task of marrying us. Thank you dearly Joanne, you made our ceremony very memorable and meaningful for us. We wish you all the very best for the future. Jo did an amazing job for our wedding 28.02.15. From the 1st meeting she was 100% on the ball with massive attention to detail, finding out about our families, friends & wedding party to include special experiences close to our hearts. Jo created the colourful, fun, unique ceremony we were after with a heartfelt, personal insight into our love and relationship. I couldn’t recommend Jo more, regardless of the theme or style, Jo will fit the mould to suit you! We would highly recommend Jo as a wedding celebrant!! From day one, we felt right at home with Jo. She genuinely cares about each and every couple that she meets and ensures that the ceremony captures the love and personality of each couple. Jo helped us every step of the way, including providing guidance as to creating the perfect vows 🙂 Our guests highly praised Jo for how professional she was, yet also making the day warm, funny and sentimental. Our ceremony was everything that we asked for and more! Jo is an amazing celebrant, she really helped to make our ceremony personal and reflect us as a couple. Her Fun personality made our whole experience so enjoyable. She really goes above and beyond for you. Her experience really showed in coordinating our large wedding party and guiding us writing our own vows and designing the service even with last minute changes. She presents extremely well and has a beautiful voice! A delight to work with and highly recommend for anyone looking for a fresh approach. Jo was wonderful throughout the whole process and delivered a lovely and memorable ceremony on our special day. Jo’s calm and fun personality certainly made it easier for me to relax in the lead up to our wedding and on the day itself too. Super bubbly and friendly. Really made effort to get to know us as a couple! If you’re looking for a ceremony that’s just like every other, Jo is not the celebrant for you. Her ceremonies tell a story, YOUR story and not just generic scripting. She gets to know you individually/couple & scripts as many drafts needed until you’re both happy with the outcome. I have known Jo for a few years now, and spent a lot of time at various events with her. She is a vibrant, a great organizer, confidant speaker. She has a fantastic sense of humor, and will add light to any wedding ceremony. I cannot recommend her highly enough. Jo is wonderful, awesome, amazing, inspirational and dedicated!!! We wanted a ceremony that wasn’t boring, stuffy or old fashioned. Jo poked and prodded until she had enough information to create the perfect ceremony (in our eyes). She delivered with perfection! Great celebrant and now great friend!!! Jo is very professional and so lovely. Was fantastic having her be part of our special day! Personal Testimonials from the beginning …. I have witnessed Joanne’s understanding of relationships and the significance of marriage mature and evolve. Joanne has a sincere interest in helping others remain true to themselves and undertake commitments consensually. In recent conversations, Joanne has expressed excitement about her role and I am excited for her solemnizing my own marriage this year. The personal qualities that I admire in Joanne are high levels of integrity, openness and honesty, strong commitment to doing her best, ability to mix with different people, attention to detail and organisational skills, as well as her enthusiasm to learn and grow. Joanne excels in situations that require high levels of inter-personal and communication skills, which was evident in the professional, mature and easy manner she approached public speaking commitments. I have personally witnessed her unique ability to connect almost instantly with people of all backgrounds and engage them in conversation. The personal qualities that I admire in Joanne are high levels of integrity, openness and honesty, strong commitment to doing her best, ability to mix with different people, attention to detail and organisational skills, as well as her enthusiasm to learn and grow. In the years I have known Joanne, I have become very aware of how important relationships are to her, with friends and family, and that she takes great pride in helping to bring people together. I have also noticed her commitment and loyalty to her all those around her and how she goes out of her way to look after those people, to make them feel special and glad to be one of her acquaintances. Joanne is an amazing person in that she seeks to always help others “keep the big picture”. Many of our friends are at the age where they are getting married and I have witnessed Joanne trying to guide them about the issues that should really matter. Joanne has a great belief that people have the right to love whom they want, and she believe that no one should be forced into marriage against their will. 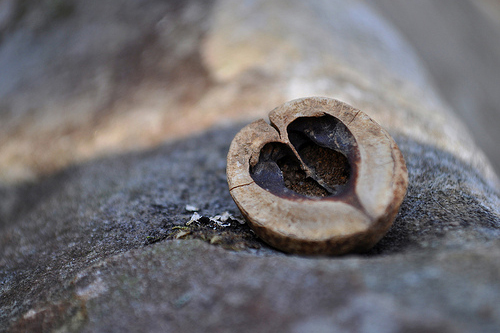 Joanne’s childhood and personal experiences with marriage and divorced have contributed to her wanting to play an active and positive role in guiding couples about the seriousness of the commitment. Joanne is responsible, intelligent and committed to working to the best of her ability. She has demonstrates these attributes within a number of her professional projects, but she has also demonstrated them by being a loyal and committed friend, who will offer support in times of stress. Joanne additional strength is that she also has the ability to know when a joke is in order, to share a laugh and cheer you up. Testimonials are like delicious, sweet, chocolate treats! To be honest, I can never get enough of them! Who would? There is nothing more heart warming than positive feedback, that’s for sure! Facebook Page for Joanne Armstrong at Wild Heart Celebrations or the Blog/Home Page. Testimonials are also tracked via Joanne Armstrong’s Easy Weddings Profile on line (simply click on the widget below to get there). Lastly, there is also a collection on Linkedin (Joanne Armstrong) which may give an idea of work and not-for-profit experience gained which helps me in my role as a civil celebrant.